For many years I’ve owned 3 ½ sets of the WTC - this one, harpsichord versions by Davitt Moroney and Gustav Leonhardt (Book 2 only) and one piano version, Glenn Gould’s. I’ve always preferred Bach on the harpsichord, while also enjoying Gould’s unique interpretive vision. It seems my preference isn’t widely shared. In doing a keyword search for the WTC on Amazon I was shocked to discover to what extent piano versions outnumber harpsichord in number and popularity. In fact, all three of my harpsichord sets are out of print. Is it the instrument or the players? Do many people simply dislike the harpsichord, or are they just attracted to certain performers? The most popular piano versions by far are the ones by Gould, Sviatoslav Richter and Andras Schiff. Gould is something of a cult figure (deservedly so, I should add) while Richter and Schiff have reputations outside of Bach. To be a harpsichordist is to be, perforce, a Baroque specialist, and Baroque keyboard music is certainly not as popular as piano music of the 19th century. Wanda Landowska was famous in her time as a pioneer, but these days no harpsichordist is likely to obtain the fame or popularity of a star pianist like Gould or Richter or Schiff. It’s true that the harpsichord’s lack of sustaining power and dynamic control is a disadvantage, which is why it fell into obsolescence. But Baroque composers knew how to write for the instrument they had. The harpsichord has a brilliant sound. The modern piano, to my ears, has a rather dull sound, not only in comparison to the harpsichord but to most orchestral instruments. I love 19th century and later piano music but its effectiveness and coloristic qualities are the result of new textures developed to suit the capabilities of the new instrument. On the modern piano Bach’s linear textures can sound rather dry. Anyway, this Gilbert set has long been my favorite of the harpsichord versions. Recently I bought the Richter and after hearing the whole thing once, decided to do a face-off between Gould, Richter and Gilbert, listening over the course of a few days to each one of the 48 three times in a row. My impressions of the performances ended up being somewhat different than from when I listened to them separately. For one thing it even more strongly reinforced my preference for the harpsichord in this music. I always listened to Gilbert last and after the piano versions it seemed like going from an arrangement to the real thing, so even when all three versions seemed interpretively equal, as was often the case, I ended up preferring the harpsichord version, i.e., Gilbert. But more than that, and somewhat to my own surprise, I concluded that interpretively Gilbert’s was superior overall to the two piano versions. Not, to be sure, in every piece. I love Gould’s playing of many of the fugues which he tends to take quite fast, bringing a thrilling kinetic quality as well as exploiting the piano’s percussive qualities. (The b flat minor fugue in Book 2 is a wonderful example of that.) On the other hand, sometime his approach can seem mannered or lacking in sensitivity. Richter has his faults too, mainly in the ponderously slow tempos he adopts for some of the longer fugues, like the b minor in Book 1 and the g# minor, B flat major, B flat minor and B major fugues of Book 2. But I could not find a single bad number in Gilbert’s set. Nor are his virtues merely negative. He is a most sensitive and even poetic interpreter. Listen, for example, to the e flat minor prelude in Book 1, or the f minor preludes in both books. One advantage of the piano, you might think, is that it’s control of touch would allow for greater clarity of part playing in the fugues. But skilled harpsichordists like Gilbert have never found that to be a problem. Gilbert is a master of agogic accents and of Baroque ornamentation, two means by which harpsichord music compensates for the lack of dynamic control. This set was first released in 1983 and, it appears, was re-released in 2003. I hope some day it comes back into print so many more people will get to know it. Meanwhile, if you can find a copy without mortgaging your house, grab it. 5つ星のうち5.0The best introduction to the WTC? In a way, this is the best possible version of the WTC to someone who is looking for a balanced, deep and totally honest version. The harpsichord is a beautiful Flemish-French (recent research shows it is rather more French than Flemish) harpsichord (Gilbert's own) that has a marvelous sound: rich and deep, and yet bright and clear. Professor Gilbert's version is as new now as it was when it was released. It is totally respectful of the music (you won't find eccentricities, here, just the music but superlatively played). He has a very cantabile sense of the music - every voice is respected - and his Bach is phrased almost as a dance, rather than as gesturing. He seems to belie Leonhardt, when the Dutch says that the piano was meant to sing and the harpsichord to speak; in Gilbert's hands, it really sings). Do not expect strong chords, abrupt contrasts or anything like that. Gilbert's version is for the connoisseur rather than the Fireworks enthusiast. If you examine, in detail, the way he plays, you will find that every voice is subtly sung, that the amount of work and serious thought he lavished into Bach's music is prodigious. 1. They didn't mistakenly tune it down a whole tone -- "reference" pitch varied and changed all over Europe since the beginning of western music. Depending on the instrument and the country, A has varied from a low of about 360 Hz to a high of about 460. However, it is undeniable that pitch has been creeping up for centuries. So, for Bach's time, A=440 would have sounded probably a semitone SHARP. 2. There is no relationship between pitch and temperament. Temperament refers to the distribution of "the comma"; the reference pitch is merely the starting tone. I used to think that the only names related to Bach's keyboard masterpieces were Moroney, Leonhardt, Gould or Pinnock. I was wrong. In this recording i found an exquisite universe full of poetic interpretations, a reflexion of this masterpiece, a supreme virtousism. 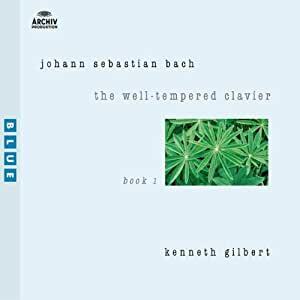 Gilbert, who was unknown to me until i bought this record, revealed to my personal experience about Bach, another point of view, as truthfull to the baroque as Leonhardt. Gilbert plays in a french style, softly, joyfully and with great inspiration. It is a good note to say that these interpretations were made in a Harpsichord of Gilbert's own collection; there's no doubt about the close relationship between the master and the "klavier", they are like two lovers.